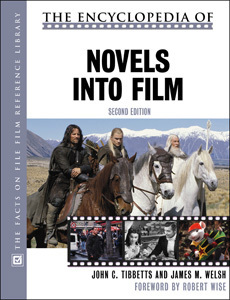 The Encyclopedia of Novels into Film, Second Edition provides a comprehensive, in-depth look at more than 300 American and foreign novels and their film adaptations. Edited and written by two renowned film scholars, with contributions from more than 70 top academics, this engaging reference explores both the popular and lesser-known films that have come to define this genre. Each of the more than 300 illuminating entries provides an overview of the literary source and a critical assessment of its various film adaptations. This edition includes more than 30 all-new entries and numerous updates to cover new adaptations, as well as many new photographs. Providing an in-depth look at how books are selected for the silver screen, The Encyclopedia of Novels into Film, Second Edition is a fascinating study for anyone interested in film and literature. "Recommended for all public and academic film collections..."
"...has a place in both academic and popular collections and should definitely be considered by libraries in which the first edition was heavily used." "...'an outstanding selective survey of a fascinating topic.'...Recommended." "...especially well done in its global scope...good construction, layout, and visual appeal."